Body composition measurements are difficult during pregnancy because of the disproportionate amount of water accumulating in the fat-free mass component during pregnancy (23). A large longitudinal study of 170 women during pregnancy using bioimpedance analysis indicated that total body water and extracellular water were significantly increased during the second and third trimesters of pregnancy (24). These researchers also found a small increase in intracellular water, which peaked in the third trimester. These changes are due to the enlargement of the vascular bed that occurs in pregnancy and the subsequent increase in blood volume (24). Standard methods of assessing body composition such as bioelectrical impedance and hydrostatic weighing may be influenced by these pregnancy-related changes in hydration (25). Thus, it is not possible to use models or equations for estimation of fat mass that have been derived in the nonpregnant population and then apply them to studies of body composition in pregnancy (26). Specific equations validated in pregnancy should be applied. 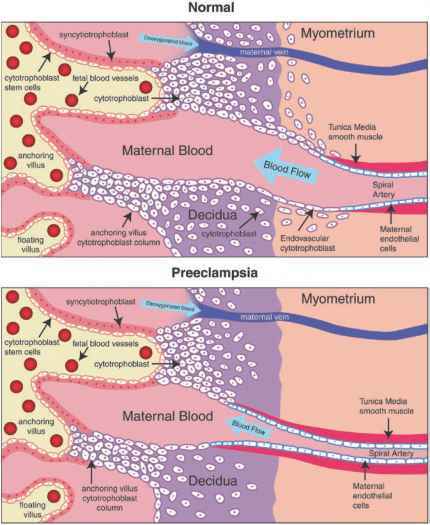 A number of methods and models for determining maternal body composition are available [reviewed in (27)], but it is clear that the means of accurately assessing maternal body composition are cumbersome and often impractical [skinfold thickness, dual-energy X-ray absorptiometry (DEXA), computed tomography (CT), magnetic resonance imaging (MRI), or ultrasound].